To meet the increasing and diversified demands of the customers. To be market leaders in different market segments. Provide quality products & reliable services and sourcing from reputed manufacturers. Become professional marketing partners for our principals to meet the objectives of sales, market information, and customer service. Be the preferred supplier of our customers, with our products exceeding their quality requirements. Harness the creative energies of all our people through team work, develop and a transparent work environment. Our vision is to be Qatar’s most customer-centric company; to build a place where people can come to find and discover anything they might want. To be the company that best understands and satisfies the product, service and self-fulfilment needs of the people of Qatar. Our duty is to bring the benefits of globalization to our customers regardless of their location; this demands a global reach in supply, yet a local perspective in customer service. We value the time, skills, and expert opinions of our staff. We are committed to providing fair and living wages, reasonable, structured work schedules, and clear duties and spheres of rights and responsibilities for each team member. CUSTOMER COMMITMENT: we develop relationship that brings out a positive change in our customers life. Think about those brands that you purchase from over and over, even when there are cheaper options out there. Do you usually fly on a particular airline? Do you buy your coffee from the same place every morning? Do you recommend a specific traders whenever ask for suggestions? That's where DELUXE group comes in. Often, the reason we stay loyal to brands is because of their values. The best brands strive to combine physical, emotional, and logical elements into one exceptional customer -- and employee -- experience. Once we successfully create a connection with our customers and consumers, many of them stay loyal for life. We have the chance to increase our overall profitability while building a solid foundation of brand promoters. 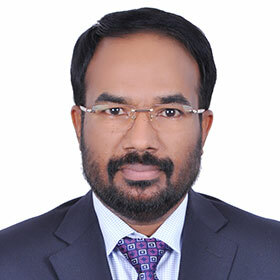 Pradeep Chandran has over 35 years of experience in the field of business in the Middle East . He is a partner of the leading business institutions such as Deluxe Trading & Services WLL, Deluxe Travels WLL, Liberty Tourism, Trice Chemicals Industrial LLC etc. Pranav Pradeep has played a key part in the company’s marketing campaigns both internally and externally by preparing, planning and project managing the publication of all publicity material to maximise brand promotion. Praveen Chandran have an experience of 25 years in the field of import of chemicals & raw materials throughout the world. Started the career as Salesman eventually leading to being the master of trade & marketing in Qatar. Salil V.R has provided management with financial information by researching and analyzing accounts; preparing financial statements for over two decades. He is responsible for all finance management of the DLX Sales department. Think about those brands that you purchase from over and over, even when there are cheaper options out there. Do you usually fly on a particular airline? Deluxe Travels is one of the division of Deluxe Trading and Services W.L.L. We make the customer feel special and experience the completeness of the services.